I don’t know why took me so long to get around to making one of these. They are easy, delicious, and very healthy. Best of all, this isn’t much different from how I would’ve made it before joining Weight Watchers. Only 190 calories a slice! If you want a fancy restaurant feel, serve it with fat-free balsamic vinaigrette. It pairs beautifully with the Brussels sprouts. Heat large cast iron pan or oven safe Teflon pan to medium heat on stove. Chop bacon into small pieces. Cook bacon until fat is rendered (melted out of the meat). Add diced garlic and thyme, and cook for about a minute, scraping pan constantly with spatula. 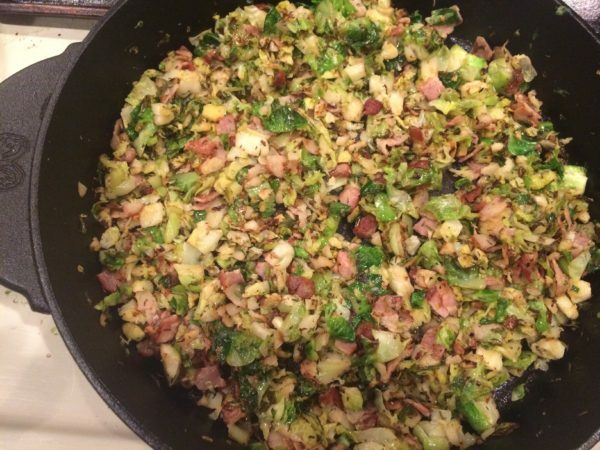 Add chopped Brussels sprouts, and coat with contents of pan. Cook until softened. 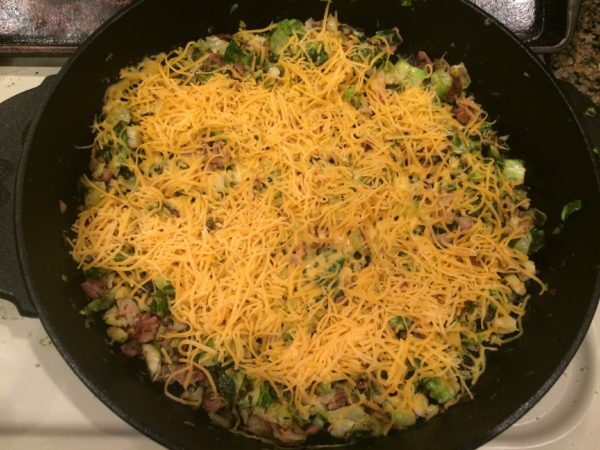 Sprinkle shredded cheddar evenly over the top of the pan. Heat until it starts to melt. In a separate bowl, whisk eggs, salt, and milk together. Pour mixture into pan, tilting pan as needed to ensure even coverage. Push down other ingredients so they’re below the surface. Heat until eggs start firming up around the edges, about 2 minutes. Place in oven on middle rack. Bake for 10 minutes. Cut open middle to test if it’s cooked through; continue baking and checking in 1 minute intervals until done. Turn on the broiler and cook for another minute or two to brown the surface. Remove from oven and allow to cool for 5 minutes. Run a spatula around the edges to release from pan. Cut into 8 equal pieces and serve with fat free balsamic vinaigrette. 1) keep oven mitts next to the stove...it’s easy to forget that the handle of the pan gets hot enough to burn you! 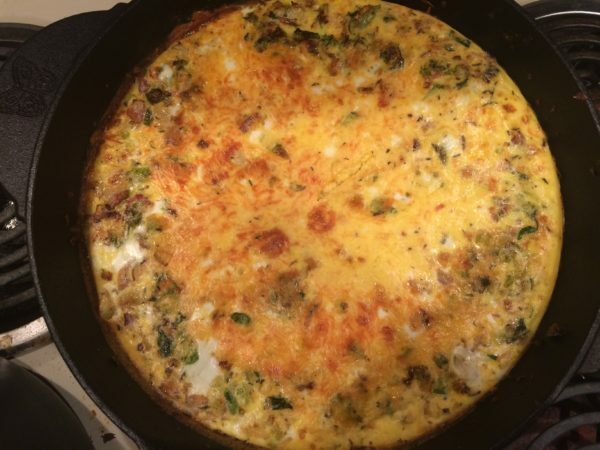 2) I used a cast iron pan, and I found that the frittata didn’t stick to the pan due to the bacon grease (so, no cooking spray needed). If you eat hard boiled eggs as often as I do, you probably have gotten very good at it. Or, maybe you’ve found that it’s hit-and-miss? 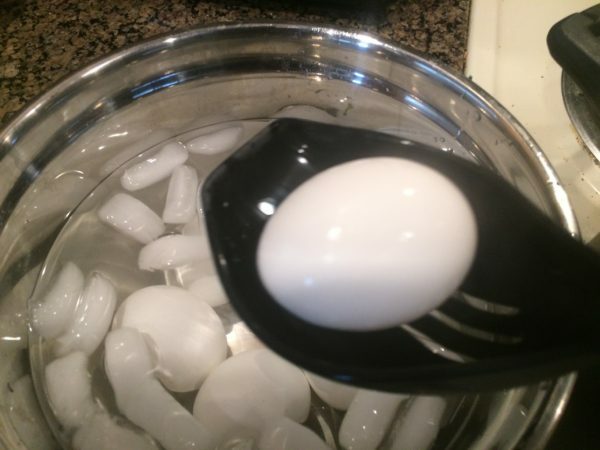 This is how I make my hard-boiled eggs come out perfectly, every time. The cook time can be reduced just as easily if you want soft-boiled eggs. Note that the salt helps to keep the eggs from cracking, while the vinegar will help with peeling the eggs. Place eggs in a large pot of cold water, with enough water to completely cover the eggs. Turn the stove on high. Raise to a boil. Add salt and vinegar. While this is going on, prepare a bowl of the ice water large enough to immerse the eggs after boiling. 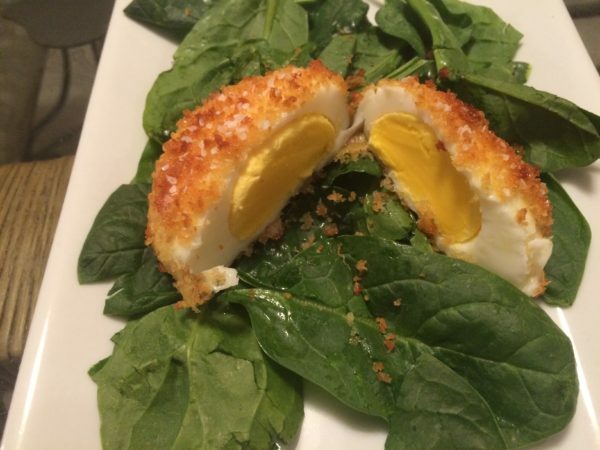 Cook for eight minutes, if you want a hard boiled egg. Soft boiled eggs are done in six minutes. Immediately remove eggs using a slotted spoon, and place in an ice water bath. This stops the cooking process, and keeps them from becoming overcooked.